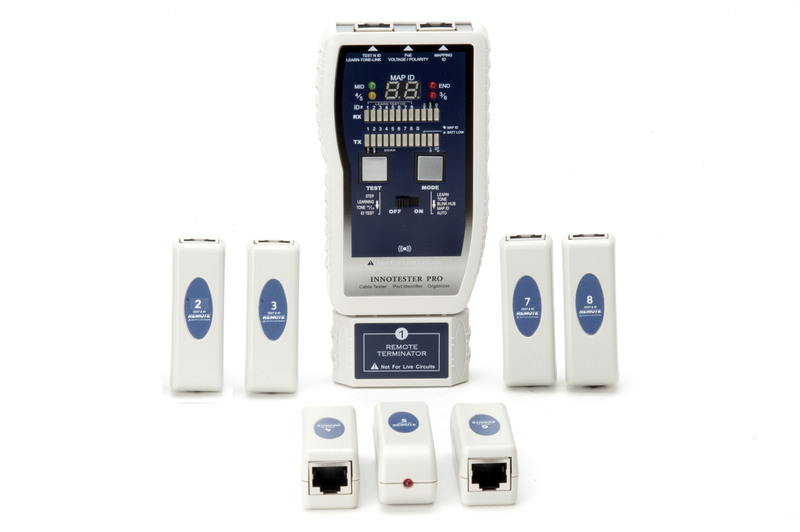 PK-170KIT: INNOTESTER PRO with #1-8 Smart Test N ID remotes, Net Probe (PR-06P) and #1-25 ID mapping only remote. 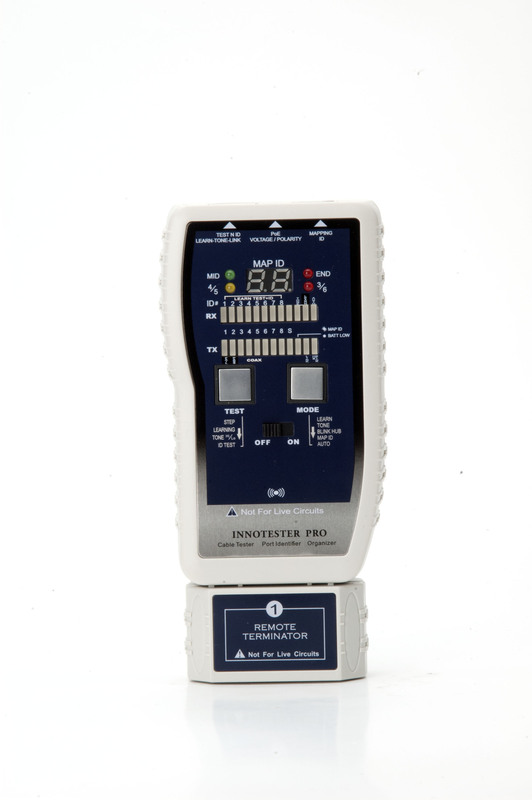 INNOTESTER PRO combines the functions of a smart cable tester, network tester, port identifier and organizer with the capability to identify up to 100 cables run at a time, and 8 Test + ID remotes allows one person to test 8 cables run up to 600 meters. Tone mode, transmits 2 powerful tones for tracing inactive and active network cables on a Switch or HUB. More effectively tracing at patch panel, termination blocks or hidden within bundles. 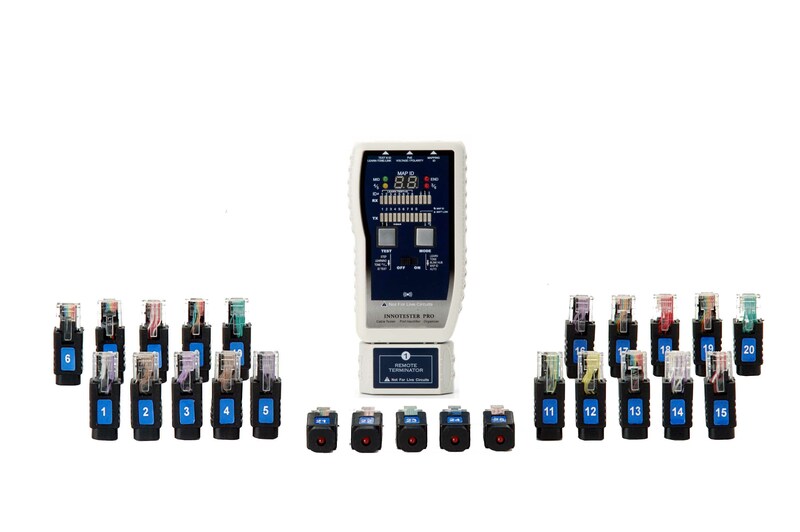 It also features a unique LEARN mode enabling rapid testing quantity of standard or custom cables via PASS/FAIL, ID with a beep sound in one second. Displays test results on the main unit for easy reading. AUTO/STEP scan modes for checking cable details pinouts. TONE GENERATION for use with probe for cable tracing. HUB BLINK mode detects and response and active network outlet and identify location on a HUB/Switch. 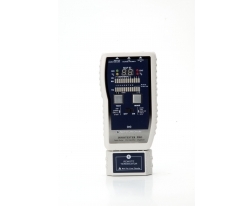 Additional features include detecting your RJ45 outlet for PoE(Power over Ethernet) existence and identify type of PSE either Endspan or Midspan in a second as well as detects the presence of phone line of voltage and checking polarity. This warn to prevent potentially damage the tester unit. PK-170 gets the job done faster and easier for saving time and cost. Verifies connectivity while pin to pin testing for opens, shorts, reversal and miswire faults. Features both AUTO/STEP scan modes for checking cable details pin configuration. Tone mode produces 2 selectable powerful tones for loacting inactive and active network cables on a Switch or HUB. Detects presence of PoE and type of PoE (Endspan, Midspan or 4 pairs) per IEEE 802.3 af/at. Detects presence of phone line of voltage and checking polarity with beep sound. Left- RJ45 jack for Test and ID. Learn, Tone and Link modes. Middle- RJ45 jack for PoE and Line voltage detection.